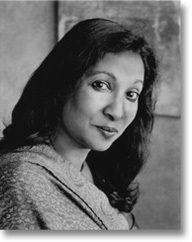 Meena Alexander's new book of poems is Birthplace with Buried Stones (TriQuarterly Books/Northwestern University Press, 2013). Her poems have been anthologized, translated and set to music. "Impossible Grace", the lyric base of the first Al Quds Music Award, was first performed in Jerusalem and "Acqua Alta", set to music by the composer Jan Sandstrom for the Serikon Music Group's climate change project, was first performed in Sweden. Alexander is Distinguished Professor of English at Hunter College and the Graduate Center at the City University of New York.